Atsushi Kono dismantles a whole chicken with speed and ease – and a very sharp knife. The manager and chef of Tori Shin, an Upper East Side yakitori establishment, demonstrated his considerable skills at his restaurant’s recent Yakitori and Sake/Shochu Tasting. 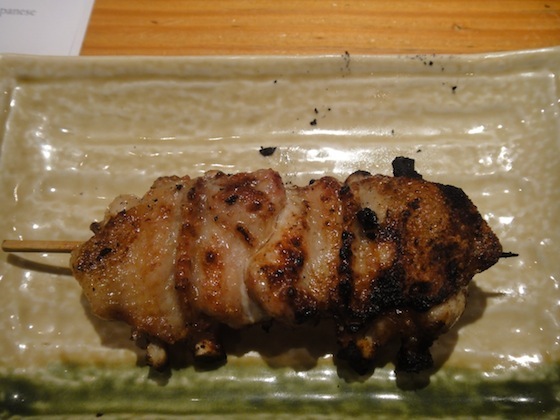 One of Japan’s most recognizable dishes, yakitori consists of bite-sized pieces of chicken on bamboo skewers and grilled over binchotan, the traditional charcoal of Japan. While making quick work of the chicken, Chef Kono described all of the parts that he uses for yakitori at his restaurant, which is, well, everything. Every morning Tori Shin receives a delivery of chickens that are organically raised on a farm in Pennsylvania, and Chef Kono deftly slices them from the tail (bonjiri) to the neck (seseri), from the joint of the chicken wing (furisode) to the chicken wing itself (teba). Tori Shin, which was awarded one star in the most recent MICHELIN Guide New York City 2012, serves delicious, flavorful yakitori fare from the standard breast, thigh, and wing meat. 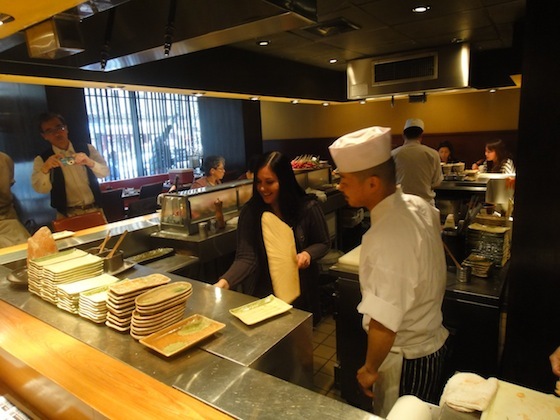 But Chef Kono and his staff make sure nothing is wasted. The organs and skin are on the menu, and even the bones of the chicken are boiled to make soup stock. The event takes place on the second Saturday of each month and costs $40. For the price participants receive eight skewers of yakitori and unlimited samples of the featured sake or shochu as well as Sapporo draft. Event organizers even prepare a handy guide to help you with keep up with the names of the chicken parts. At this particular event Chef Kono invited guests – including yours truly – to grill a few skewers, a rare opportunity at an award-winning restaurant. 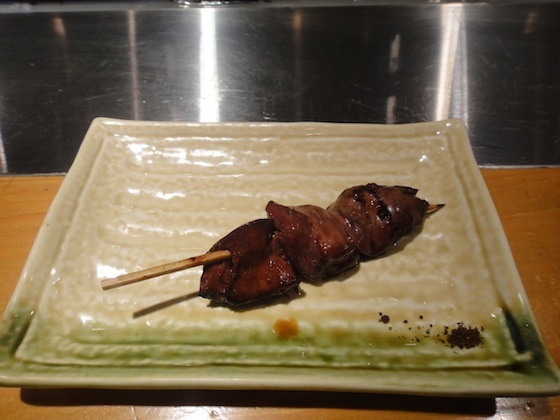 For an authentic yakitori experience, go to Tori Shin, located at 1193 First Avenue between 64th and 65th Streets. To see more pictures of the Yakitori and Sake/Shochu Tasting, please visit JapanCulture•NYC’s Facebook page.